U.S. special operations forces are set to conduct operations against North Korean nuclear, missile, and other weapons of mass destruction sites in any future conflict, the commander of Special Operations Command told Congress Tuesday. "We are actively pursuing a training path to ensure readiness for the entire range of contingency operations in which [special operations forces], to include our exquisite [countering weapons of mass destruction] capabilities, may play a critical role," he told the subcommittee on emerging threats. "We are looking comprehensively at our force structure and capabilities on the peninsula and across the region to maximize our support to U.S. [Pacific Command] and [U.S. Forces Korea]. This is my warfighting priority for planning and support." Disclosure of the commander's comments comes as tensions remain high on the peninsula. President Trump has vowed to deal harshly with North Korea should another underground nuclear test be carried out. Test preparations have been identified in recent weeks, U.S. officials have said. Trump said on Sunday that China appears to be pressuring North Korea but that he would be upset if North Korea carries out another nuclear test. "If he does a nuclear test, I will not be happy," he said on CBS Face the Nation. Asked if his unhappiness would translate into a U.S. military response, Trump said: "I don't know. I mean, we'll see." Gen. Thomas' testimony did not include details of what missions the commandos would carry out. A spokesman for the Special Operations Command referred questions about potential operations in Korea to the Pacific Command. Additionally, special operations commandos could be used for operations to kill North Korean leaders, such as supreme leader Kim Jong Un and other senior regime figures. A defense official said U.S. commandos in the past have trained for covert operations against several types of nuclear facilities, including reactors and research centers. 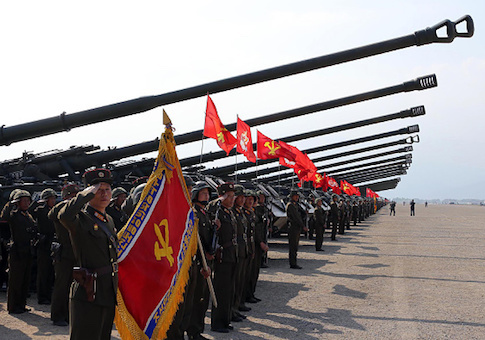 Scale models of some North Korean weapons facilities have been built in the United States for practice operations by commandos. The most secret direct action operations would be carried out by special units, such as the Navy's Seal Team Six or the Army's Delta Force. Thomas said the command in January took over the role of coordinating Pentagon efforts to counter weapons of mass destruction from the Strategic Command. The mission includes stopping the spread of weapons of mass destruction and dealing with the aftermath of such weapons' use. North Korea is believed to have around 20 nuclear devices and is developing nuclear warheads small enough to be carried on long-range missiles. It also has stockpiles of chemical weapons and biological warfare agents. Many of North Korea's nuclear facilities are believed to be located underground in fortified locations spread around the country. The last rotation of special operations forces to South Korea took place in February when parts of the 1st Special Forces Group (Airborne) and the 75th Ranger Regiment joined South Korean troops for training. The training took place in mountainous parts of South Korea in a bid to simulate the rough terrain commandos would experience during operations in North Korea. Other training took place on the seas. Gen. Thomas, in his testimony, identified North Korea as one of five "current and enduring" military threats outlined in a new military strategy produced by Marine Corps Gen. Joseph Dunford, chairman of the Joint Chiefs of Staff. The four other threats are terrorism, Russia, Iran, and China. Asked about the new strategy, a Joint Chiefs of Staff spokesman said the latest national military strategy is secret. "A classified [National Military Strategy] will make it more difficult for adversaries to develop counter-strategies and also enables the chairman to give the best military advice to the president and secretary of defense," Navy Capt. Greg Hicks said. The command "has recently focused more intently on the emerging threat that is of growing concern to us as well as most of our DoD teammates—the nuclear threat of an increasingly rogue North Korea," Thomas said. "Although previously viewed as a regional threat, North Korea's relentless pursuit of nuclear weapons and intercontinental ballistic missiles, facilitated by a trans-regional network of commercial, military, and political connections, make it a threat with global implications," the four-star general added. South Korea's special operations forces are said to be highly trained but lack the advanced equipment used by American commandos, such as stealth helicopters and aircraft as well as other high technology and advanced weaponry. A Pentagon report on North Korea's military published in February 2016 states that North Korea continues to advance its nuclear program. The North Koreans announced in September 2015 that the nuclear facilities at Yongbyon including a uranium enrichment plant and a reactor that were upgraded for the purpose of building nuclear forces, the report said. Pacific Command commander Adm. Harry Harris said in congressional testimony last week that North Korea is an immediate threat to the security of the United States and the Asia Pacific region. "With every test, Kim Jong Un moves closer to his stated goal of a preemptive nuclear strike capability against American cities, and he's not afraid to fail in public," Harris said.